The famed Gettysburg Cyclorama painting, the star attraction of the new Gettysburg National Park Visitors Center and Museum, is a sight to behold, especially in its freshly restored state and beautiful new, high-tech setting. As well known as the attraction may be, I suspect many visitors are not aware of the peregrination of the painting itself and the fact that it was originally created for display in Boston. The “Cyclorama of the Battle of Gettysburg” was painted by Paul Dominique Philippoteaux. 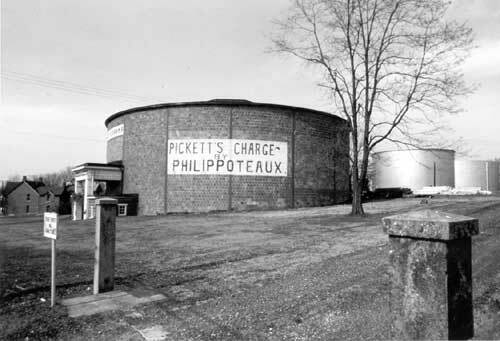 An accomplished artist who had already painted a number of cycloramas depicting important European battles, Philippoteaux was invited to the United States in 1879 by a group of Chicago businessmen who commissioned the Battle of Gettysburg cyclorama. Cycloramas were all the rage at the time and would be for another 20 years or so until the newfangled cinemas stole the limelight. A cyclorama was not only a spectacle in terms of sheer size and complexity of the painting. Being a 360 degree image, it tended to trick the senses. Add some actual 3D scenery in the foreground and a viewer was likely to feel as though they had been transported to some other place at the precise moment of a major event. A section of the Battle of Gettysburg cyclorama. NPS photo. The Battle of Gettysburg cyclorama depicts the culmination of Pickett’s Charge, the failed frontal assault by the Confederates that ended the battle on July 3, 1863. The vantage point is from “The High Water Mark,” the only part of the Union line where Confederates temporarily broke through. Philippoteaux plunged himself into the research in 1882, setting up a platform on Cemetery Ridge at the High Water Mark from which photographs were taken and many sketches were done to get the lay of the land. Philippoteaux also interviewed several veterans, including a number of Union generals, to learn key details. Four versions of the Battle of Gettysburg cyclorama were painted by Philippoteaux and a team of 20 artists. As if one titanic undertaking weren’t enough! Only two survive today. The first one (the Chicago cyclorama) has spent most of its history stored in boxes and is now in the hands of a group of North Carolina investors who hope to one day have it restored and displayed. The second painting, the one now on display in the Gettysburg Visitors Center and Museum, was completed in 1884 and originally displayed in Boston. The Boston cyclorama was commissioned by Charles Louis Willoughby, a fantastically wealthy department store magnate from Chicago who had roots in New England. This Willoughby fellow intrigues me. Despite his prominence as a Gilded Age tycoon, his story is difficult to thresh out. A Chicago Tribune article indicates that even the Chicago Historical Society has virtually no records about him. What I know so far is this…He was born in New Hampshire around 1835. In 1870, he established a clothing company, Willoughby, Hill & Co., with David K. Hill who would be his longtime partner. Even in the wake of the Great Chicago Fire in 1871, these savvy businessmen managed to do well and eventually they built and ran one of the biggest department stores in Chicago. Willoughby and Hill also owned businesses in Boston, including the famous Union Oyster House. If I were to venture a guess, I’d say Willoughby got his start in Boston or Lowell and therefore maintained an interest in the area. I do know he summered in Plymouth, Massachusetts (figuratively in my backyard) purchasing the old Edward Winslow House on North Street (the very same house that Ralph Waldo Emerson was married in, by the way). 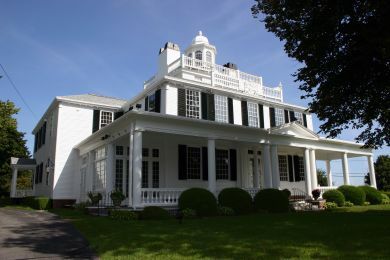 Willoughby transformed the relatively plain, colonial house into the finest mansion in Plymouth and, upon his retirement, lived there year-round. He died there in 1919. The mansion is now the stunning headquarters of the Mayflower Society. For a time, I lived right across the street from the place and admired it every day. I knew a man named Willoughby was responsible for its grandeur, but I had no idea until recently that Willoughby was also the money behind the Gettysburg cyclorama. Willoughby was likely one of the investors in the first Chicago version. Seeing its success, he apparently decided to commission his own to be displayed in Boston. He would be the sole owner of this venture. In 1884 he constructed an elaborate building on Tremont Street in which to display the attraction. A circa 1923 front now mostly obscures the original building which was quite martial and imposing. 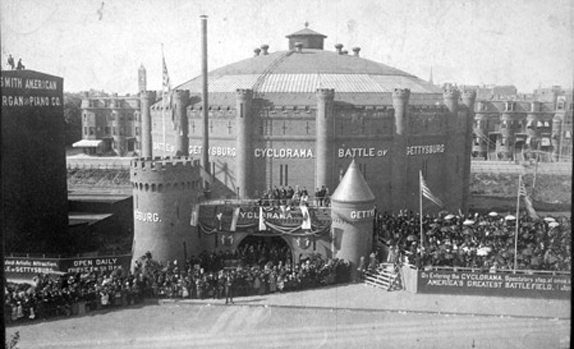 Designed by the firm of Cummings and Sears (who also designed Old South Church in Copley Square and the Isabella Stewart Gardner Museum) the Cyclorama Building stood like a great castle in Boston’s fashionable South End. 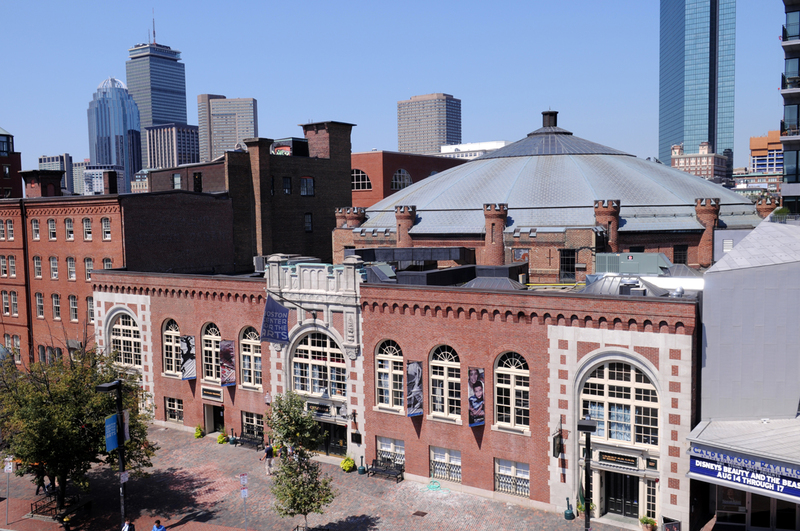 After cycloramas declined in popularity, the building became an arena for sporting events, served as a garage and industrial space, was the home of the Boston Flower Exchange from 1923 to 1970, then was purchased by the Boston Center for the Arts. Still owned by the BCA, the impressive building is a multi-purpose function site used for theatrical productions, expositions, weddings, trade shows, etc. The Battle of Gettysburg cyclorama painting was displayed in Boston from 1884 to 1891. It was then shipped to Philadelphia and shown there for roughly a year. It returned to Boston but was not put back on display. It sat in crates for about 18 years, sometimes set outside behind the Cyclorama Building, and suffered some unfortunate decay. In 1910, the painting was purchased by Albert J. Hahne of Newark, New Jersey. He displayed sections of the cyclorama in his department store in Newark. Sections were also loaned out and displayed in Washington, Baltimore and New York. The 1913 Cyclorama Building on Cemetery Hill. NPS photo. In anticipation of the 50th anniversary of the battle in 1913, a group of Gettysburg businessmen decided to pitch in and purchase the cyclorama painting. A “temporary” building, somewhat hastily put together in time for the big event, was constructed for the painting on Cemetery Hill along Baltimore Street. It remained there for much longer than planned, in less than ideal conditions…some 46 years until it was purchased by the National Park Service in anticipation of the 100th anniversary of the battle. The NPS restored the painting in 1959 and moved it to a new Cyclorama Building constructed in 1962 in Ziegler’s Grove. Its new location stood close to the High Water Mark where the very scene depicted by the painting played out and near the spot where Philippoteaux had constructed his platform 80 years prior. The 1962 Richard Neutra cyclorama. NPS photo. 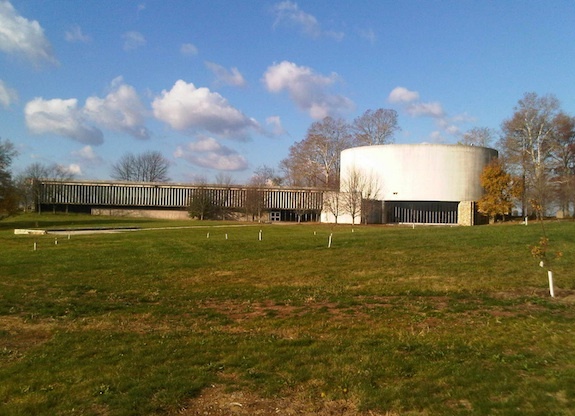 The 1962 Cyclorama Building was designed by Richard Neutra, a leading modernist architect. The Neutra building was slated for demolition in 2008 when construction was completed on the beautiful new NPS visitors center, museum and cyclorama. I hardly need tell of the ensuing legal battles over the fate of the Neutra building as it has all been recent news. Frankly, I have never understood brutalist architecture…cannot for the life of me figure out why architects of the 60s and 70s thought we would all enjoy walking through a world full of concrete bunkers. So, when I heard of preservationists fighting to save Neutra’s cyclorama building, I shook my head. Yes, I get it, it was a prime example of modernist architecture and a relic of the battle’s centennial era. But I am astounded when I read descriptions of the thought that went into the building, some of it written many years ago by NPS staff as a sort of justification for it. Particularly gems like this: “Neutra drew on regional history, natural surroundings, and personal experience to discover universal principles, which he then attempted to represent in built form.” Sorry, but how does a concrete cylinder represent regional history or natural surroundings? In short, I saw it as a great victory when the building was taken down just five months ago and another section of hallowed ground was reclaimed. But I digress…back to the painting. The Boston/Gettysburg cyclorama painting of Pickett’s Charge, now nearly 130 years old, is featured in its fourth long-term home, the Gettysburg National Military Park Museum and Visitors Center. The National Park Service and its private partner, the Gettysburg Foundation, implemented five years of restorative work on the painting from 2003-2008, amounting to $15 million. It is located a good distance from any ground where fighting took place. 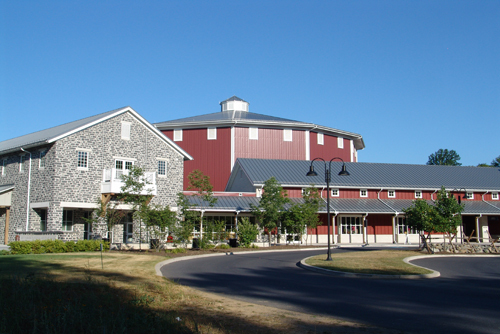 The structure in which it is housed is evocative of a Pennsylvania round barn. Now that’s drawing on regional history and surroundings. It’s no castle, but I think even Charles Willoughby would be impressed. National Park Service, “The Gettysburg Cyclorama”. Deborah Fitts, “Wanted: A Home for the Second Gettysburg Cyclorama,” Civil War News, (Feb/March 2005). Jim Weeks, Gettysburg: Memory, Market, and an American Shrine, (2003), p. 110. Deborah Fitts, “Investors Buy the First Gettysburg Cyclorama Painting,” Civil War News, (May 2007). Charles M. Madigan, “Era Of Big Paintings Of Big Events Made Its Mark In City Of Big Shoulders,” Chicago Tribune, March 1, 1999. Dean Thomas, The Gettysburg Cyclorama: A Portrayal of the High Tide of the Confederacy, (1989), p. 17-19. Sarah Allaback, Mission 66 Visitor Centers: The History of a Building Type, (2000), p. 104. Lisanne Renner, “Big Touch Up for the Blue and the Gray,” New York Times, July 7, 2008.